A typical intersection has numerous “conflict points.” A conflict point (in highway design) is any point where two or more vehicles can conflict with each other. In a standard four-way intersection, numerous conflict points exist. Additionally, conflict points created by vehicles turning left across traffic are especially dangerous. The Alabama Department of Transportation publishes a highway access manual that discusses the dangers of intersections and conflict points. I have taken the depositions of highway engineers in the past and find these issues fascinating but will avoid a long, detailed discussion in this post. 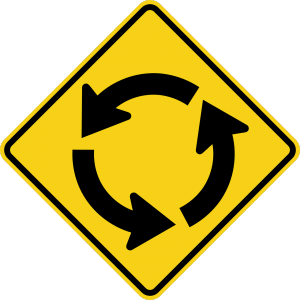 For the shortened version of conflict points with intersections versus roundabouts, the U.S. Department of Transportation notes a conventional intersection has at least 32 conflict points while a corresponding roundabout reduces that number to 8 conflict points. Studies of intersections in the United States converted from traffic signals or stop signs to roundabouts have found reductions in injury crashes of 72-80 percent and reductions in all crashes of 35-47 percent. A study of 19 higher-speed rural intersections (speed limits of 40 mph or higher) that originally had stop signs on the minor approaches and were converted to roundabouts found a 62 percent reduction in all crashes and an 85 percent reduction in injury crashes. Studies of intersections in Europe and Australia that were converted to roundabouts have reported 25-87 percent reductions in injury crashes and 36-61 percent reductions in all crashes. Based on the results of a 2004 Institute study, it is estimated that the conversion of 10 percent of the signalized intersections in the United States to roundabouts would have prevented approximately 49,000 crashes in 2014, including 189 fatal crashes and 31,000 crashes involving injuries. These studies show substantial safety benefits for roundabouts. I think the primary drawback to their construction is not safety but simply driver unfamiliarity. As more roundabouts are constructed, that issue is likely to lessen or resolve. While my blog is primarily about personal injury law and safety issues, I need to mention some of the other benefits possible with roundabouts. Some traffic engineers point to benefits beyond safety. These include studies showing roundabouts reduce traffic congestion by promoting a continuous flow of traffic. Another potential benefit includes reduced costs — no long-term costs associated with the equipment and maintenance of expensive traffic signals. Finally, some designers believe roundabouts actually save space. While roundabouts may need more space within the actual intersection, they often use less space on approaching roads. Roundabouts have been shown to be a safe and efficient alternative intersection design, when designed for the local situation. It is anticipated that candidate Alabama sites will be evaluated to determine where roundabouts may be a cost effective alternative to other types of intersection operation. Thirty years ago, the roundabout on USA’s campus was a novelty. With studies showing roundabouts improve safety, decrease the number of serious car accidents and help traffic flow, I expect urban areas of Alabama will consider the option as a good alternative at some intersections. At the Blackwell Law Firm, we help car crash victims recover compensation for their personal injuries. We frequently discuss and publish articles important to issues of highway safety. If you have questions, we are happy to talk with you. Consultations are always free and confidential.